Welcome to Part 5. I missed the recent Blog Bat Around focusing on autographs and building a team with the signatures in their collection. I honestly don’t have enough autographs to make that workable anyway (unless I were to draw from pack pulled stuff I have sitting around that I haven’t sold or traded yet). So, instead, my contribution is a heavy hitter in my pre-existing series. I was lucky enough to grab this off of ebay back in 2014. Back then, Gwynn autographs were significantly cheaper (for obvious reasons), and in this case, it was even more so thanks to the unlicensed nature. People have sort of caught on and realized that logos or not, basketball photo or not, that these UD Black autos are fantastic and the ones I don’t have are too pricey for me to go after currently. Not to brag, but this only cost me $20, which is half or less of the current price. Tony has one of my favorite signatures. It’s extremely readable and that looping T and the pronounced sharp lines on the Ys have an elegance to them that really fit his character. I’ve seen a lot of examples of his signature and Tony was great about filling in the areas given to him. It is a vertical and horizontal design and can extend in all directions as needed. I can’t imagine anyone would claim laziness on this signature, and it’s incredibly consistent. Remarkably so. Despite the consistency, this autograph’s T is a bit more jagged than what I normally see. Still, the silver ink against the matte black paper looks great. I love the young picture of Gwynn honoring his basketball skills. Even though it’s unlicensed and not even a baseball card, this is currently my favorite autograph in my collection (across all players). 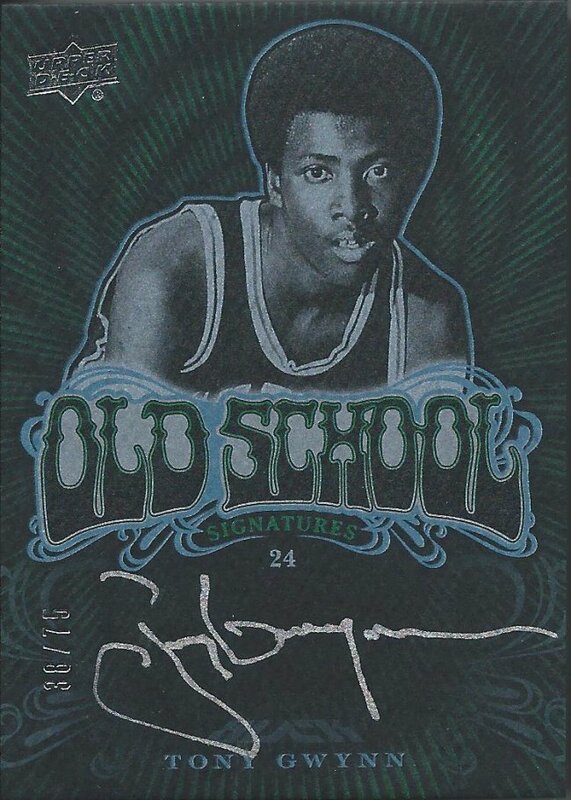 Tony was a very frequent signer, and unfortunately, we still occasionally see some sticker autos in current products today. My collection is over double-digits and I’m happy to slowly build that up further, but it will be tough to beat this one.